It seems I’ve become something of a convert to the joy of a good bivvy lately. Even with the less than ideal weather lately, my Laser Comp seems to be doing little more than gathering dust in the gear cave that is my spare room. For the convenience and comfort imparted by each step towards more elaborate shelter – we dilute the rawness of our experience with nature. This point is basic, obvious even – but it is worth making. Ever since man moved into the first caves to provide safety from predators and the elements, our direct connection to nature withered just a little – as it has withered ever since. This is quite possibly the very reason so many of us seek out organised time in the outdoors in the first place – we want some of that back. In a bivvy you get it all – good and bad. Rather than laying back and staring at brightly coloured mesh cloth until you drift off, you watch the clouds roll overhead, the stars twinkle. You feel the wind gently roll over your face and catch sight of the occasional bird or fox. Of course you get increased exposure to the other end of the experience spectrum – you get the rain driving down onto you, howling wind and an immediate, bright end to your sleep when the sun rises. But that’s part of the deal. The general thinking behind it is – if you’re getting out there to get close to nature, a closer experience is one worth considering. You’ll get the good and the bad, but both are equally likely to make a memorable camp. 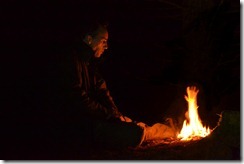 I recently went on a quick impromptu bivvy with Oisin and Dave, two good camping buddies. Everything was basic. Bivvy bags provided basic shelter. Food and drink was basic. While there was plenty of time for conversation, there was no discomfort in the occasional time to quietly reflect. A bit of comfort while camping is no bad thing, nor is the occasional camp of sheer overindulgence, but every now and then, a nice, basic camp can help provide a little framing and perspective – and remind us what it’s all about. Great article. I think the art in hiking is to know when to carry more and when to carry less. People tend to stick to not enough gear or too much. It's good to be able to mix it up. Nice article from a fellow bivvy fan. Nice article anyway. I'm a very modest non-self-promoting chap so I shan't put in a link to where you can buy 'Book of the Bivvy'. (Just Google it.) And give my regards to the Mournes, too long since I was over there. I'll admit that paraphrase took some pretty significant creative license, my copy of the book of the bivvy wasn't to hand at the time. As much as us lads love the Mournes we're looking at a good trip to Scotland in the new year to get a bit of variety, some new views to wake up to. Really looking forward to it. Two years on and I still love a good bivvy. If you're on the fence about trying this give it a go! Terra Nova no longer sell it, they're probably in the process of doing the R&D for a replacement model, but if you keep an eye out on ebay you can pick up a bargain. I've slept literally well over a hundred nights in the Titan and I can honestly say it's in a league of its own.